An important goal of the association BENKADI is the safeguard of oral traditions in Africa. From 2001 to 2003 the project „Cultural Decentralization“ led us into the rural community Fangasso to collect the orally transmitted narrations. 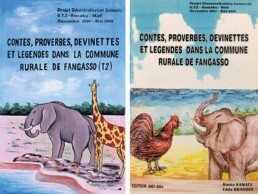 The two booklets presented below are collections written in bomu with a French translation. This way we provide the 3000 bomu-speakers in the schools of the region an additional collection to keep the language alive and deliver an important insight into the traditions of the Buwa. Besides the application at school, the booklets facilitate the efforts of the communities in the alphabetization of adults. The stakeholders of a gentle tourism are provided with an important document of local traditions. The project was executed with the friendly support of the German Embassy in Bamako.